Most of us will have got the news about the terrible fire via video. On Twitter, my usual source for breaking news, citizen journalist pictures were largely streaming video. The TV news coverage then seemed to stream continous live images of the same scenes, with talking head voice overs. 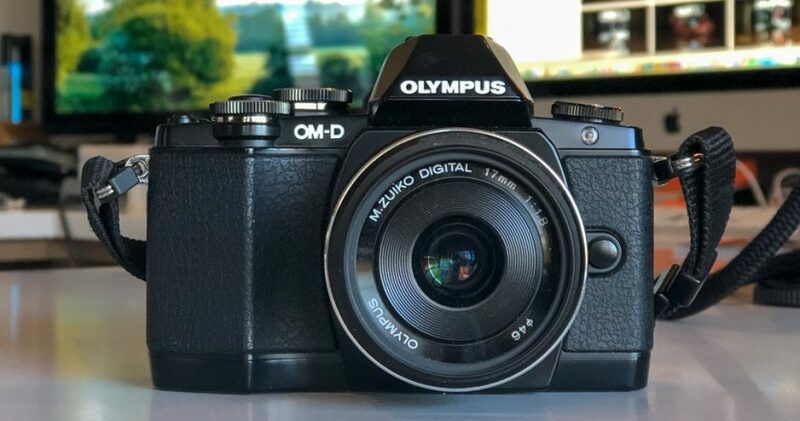 What is interesting, however, this morning, is now most outlets are carrying some still photography, and a few images (and photographers) are starting to stand out. In the quest for ‘iconic’ photographs of the event, I would offer four photographers who might get that honour, over time. Ian Langsdon, of the EPA, Francois Guillot, of AFP Getty, Phillipe Wojazer, of AP Getty and Geoffroy Van Der Hasselt, AFP Getty. 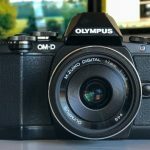 Here are the Instagram feeds of Ian Langsdon and Phillipe Wojazer. I choose Ian Langsdon’s as the header, catching the moment that the spire fell, as the moment many people who were watching, either at the site or on TV, will remember. The event is totally different in kind to 9/11, yet ‘the fall’ has eerie similarities. The header is a published crop of Langsdon’s photograph taken at a wider angle. Ian Langsdon /EPA-EFE /Shutterstock. 2019. 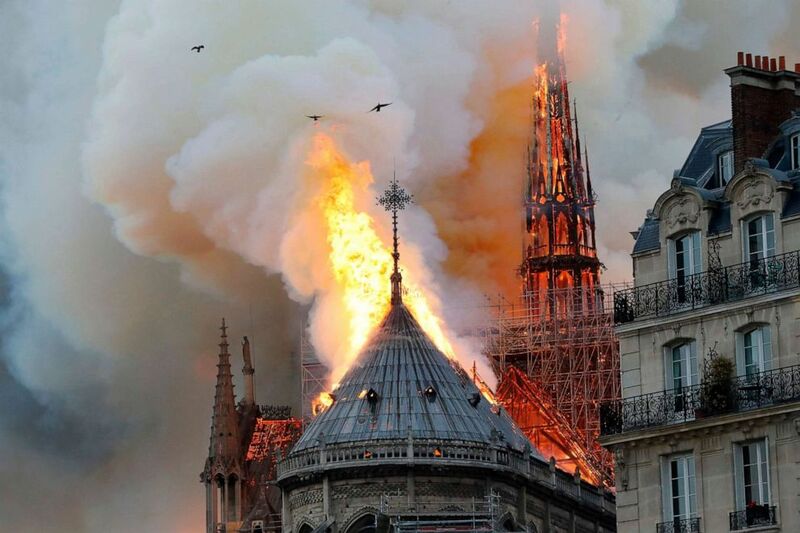 The spire collapses while flames are burning the roof of the Notre-Dame Cathedral in Paris, France, 15 April 2019. People. Possibly the best morning-edition news spread is in The Atlantic, with dramatic editorial choices and large images. This photograph, by Francois Guillot, is one of many that captured the environment of Notre Dame and the billowing smoke, setting the scene and context for the fire. Francois Guillot /AFP / Getty Images. 2019. 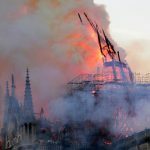 Smokes ascends as flames rise during a fire at the landmark Notre-Dame Cathedral in central Paris on April 15, 2019 afternoon. The Atlantic. And this, also by Francois Guillot, seems to capture the dread people felt about what was happening to Notre Dame, as it burnt. 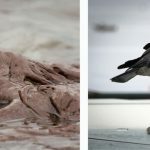 The birds provide ‘punctum’? Francois Guillot / AFP / Getty Images. 2019. Smoke and flames rise during a fire at the landmark Notre Dame Cathedral, in central Paris, on April 15, 2019. The Atlantic. This photograph, from Geoffrey Van der Hasselt, caught the ‘decisive moment’ that the top of the spire fell. Geoffroy Van Der Hasselt / AFP / Getty Images. 2019. 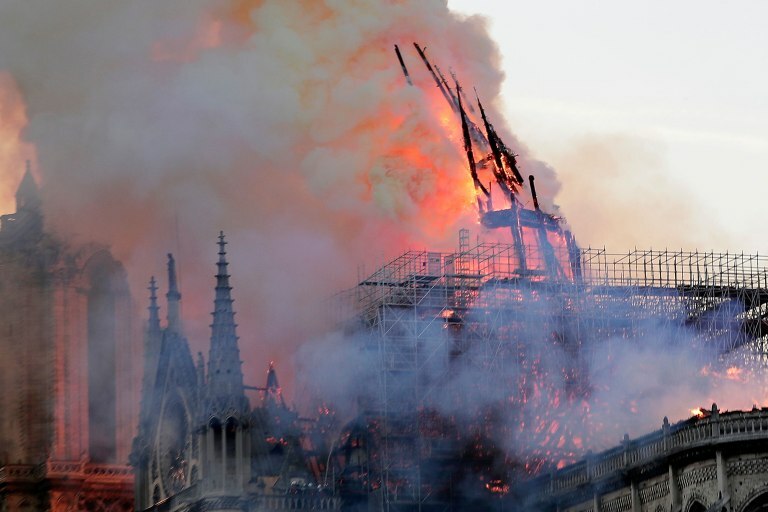 The steeple collapses as smoke and flames engulf the Notre-Dame Cathedral in Paris on April 15, 2019. The Atlantic. I should add a ‘human interest’ photograph, showing the onlookers and people using their phones to record the event. By Benoit Tessier, Reuters. Benoit Tessier / Reuters. 2019. 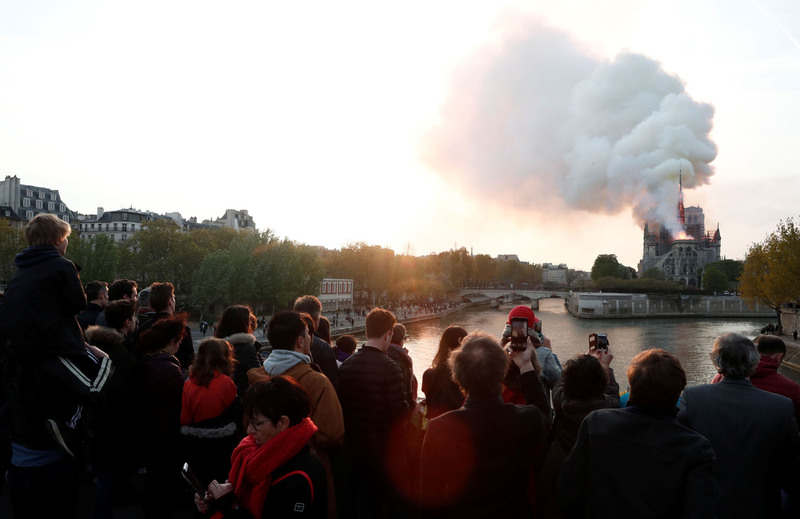 People watch from a bridge as smoke billows from Notre Dame Cathedral during a fire in Paris, France April 15, 2019. The Atlantic. Surprisingly, The Atlantic missed this next image, from Philippe Wojazer. Replete with symbolism, I suspect that this photograph will be one of those that we see a lot. Philippe Wojazer / AP / Reuters. 2019. Smoke is seen in the interior of Notre Dame Cathedral in Paris, April 15, 2019. ABC News. One other image – this time a still taken from an aerial TV camera. Shocking in showing the intensity and breadth of the fire. AFP / Getty Images. 2019. An image taken from a television screen shows an aerial view of the Notre-Dame Cathedral engulfed in flames on April 15, 2019, in the French capital, Paris. ABC News. Gem pointed out the next photograph, taken by AGPhotographe and posted on social media. A stunning image of Notre Dame and the Tour Eiffel. Interestingly, this does not yet feature in today’s main stream media, although a visit to Instagram shows the photographer getting requests. I suspect that is because it is more an ‘editorial’ image than a ‘breaking news’ one. Still, will it become ‘the’ image? A.G.Photographe. 2019. Notre Dame on Fire. Flickr. 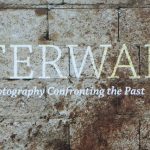 My overall conclusion – whilst we do today get our news via video, I have a suspicion that our collective memory of events is memorialised by still photographs. In fact, the photographs are our memories. 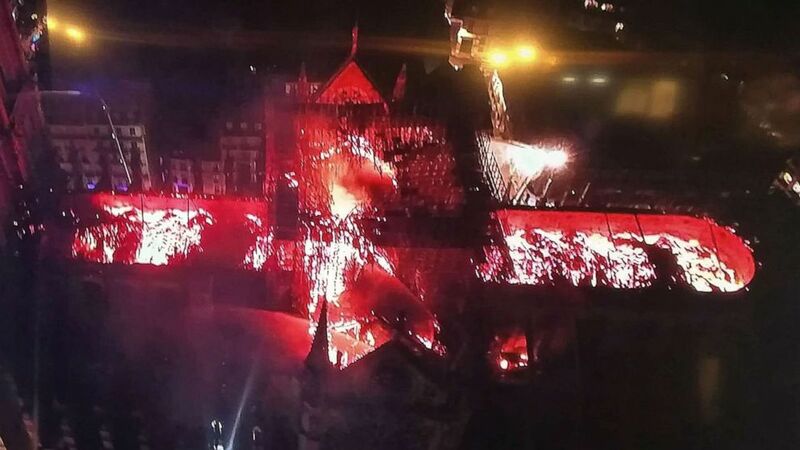 The spire collapses while flames are burning the roof of the Notre-Dame Cathedral in Paris, France, 15 April 2019. People. Alan Taylor / The Atlantic. 2019. Photos: The Devastation of Notre Dame Cathedral. 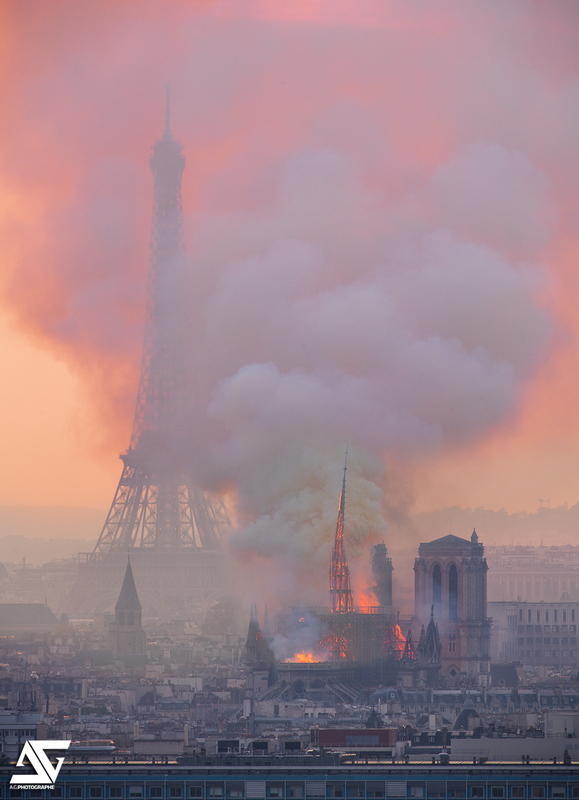 Available at: https://www.theatlantic.com/photo/2019/04/photos-notre-dame-cathedral-burns-paris/587203/ (accessed 16/04/2019). Joelle Goldstein / People. 2019. 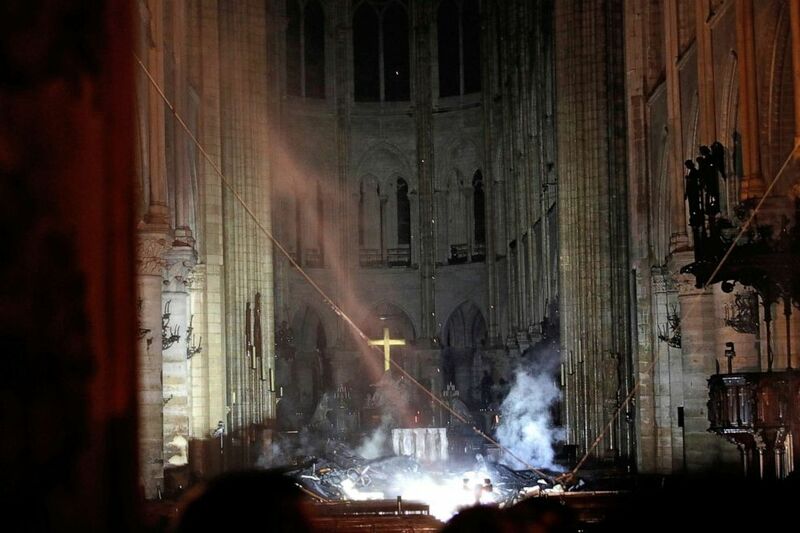 After fires burned through the Paris landmark, photos showed a cross still standing among the ashes in the cathedral. Available at: https://people.com/travel/cross-notre-dame-cathedral-shines-through-smoke/ (accessed 16/04/2019). Julia Jacobo / ABC News. 2019. Flames cause ‘colossal damages’ to Notre Dame Cathedral in Paris, Macron says ‘we will rebuild’. 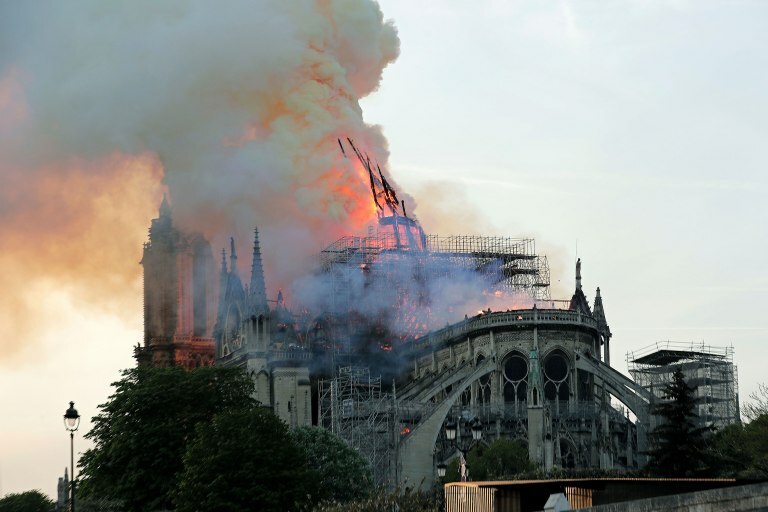 Available at https://abcnews.go.com/International/fire-breaks-paris-notre-dame-cathedral/story?id=62411000 (accessed 16/04/2019). Mackenzie Schmidt and Peter Mikelbank / People. 2019. 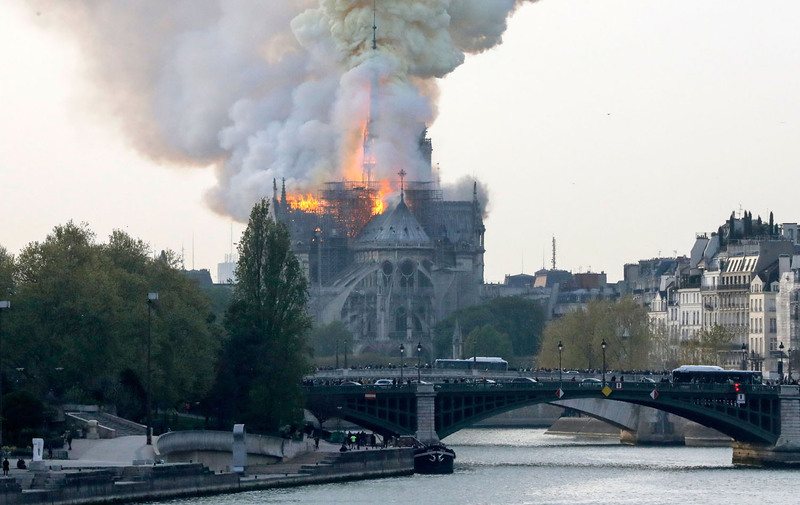 Paris’s Notre Dame Cathedral ‘Saved and Preserved’ After Massive Fire, Says Official. 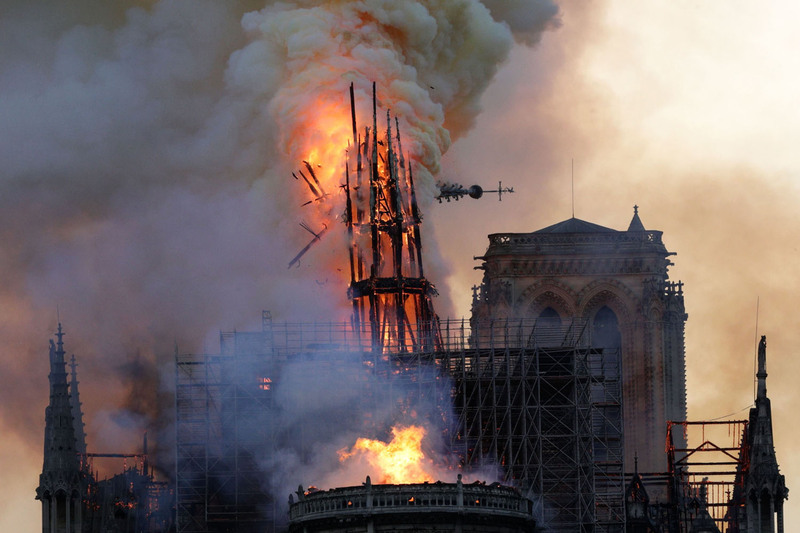 Available at: https://people.com/travel/notre-dame-on-fire-paris/ (accessed 16/04/2019). I am finally getting around to looking at the colour versions of the images I took on my the last Cambodia trip. In an earlier post, I looked at the original colour image, a straight forward black and white conversion, and an infrared black and white, as in the header. finally, there seems a certain grace and respect, and understatement which also works well with the idea of beautiful paradox. 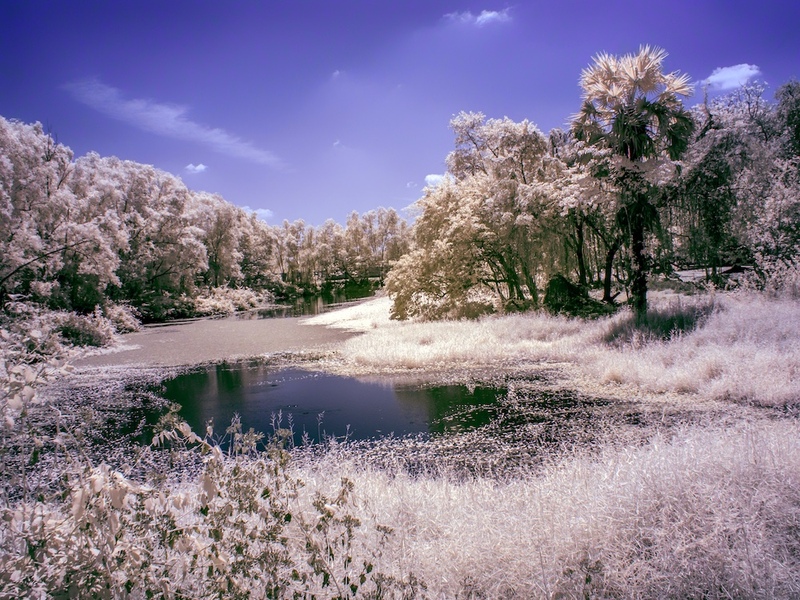 Vladimir Migutin is a fine art photographer, using infrared. His 2017 series on Chernobyl is interesting. Vladimir Migutin. 2017. The Nuclear power plant sarcophagus, Chernobyl Exclusion Zone. 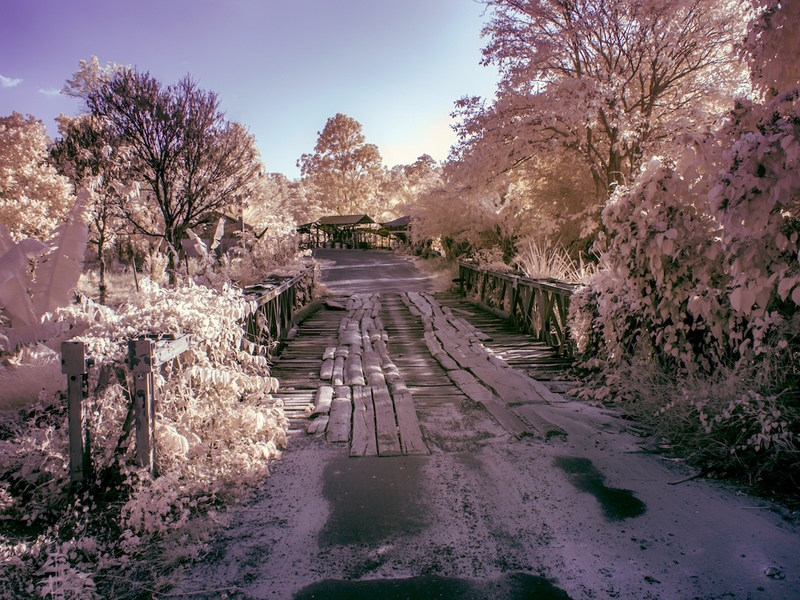 Migutin uses a full-spectrum infrared conversion with on camera filter, which means that the camera is capturing the ‘proper’ colour and the infrared at the same time. I use a 720nm conversion, which does not capture the visible light spectrum as-is. Vladimir Migutin. 2017. The iconic 85 foot tall Ferris wheel in Pripyat’s amusement park. His images are haunting, though in using the full spectrum, the images are deliberately rather fantastic and thus quite obviously unreal. Vladimir Migutin. 2017. 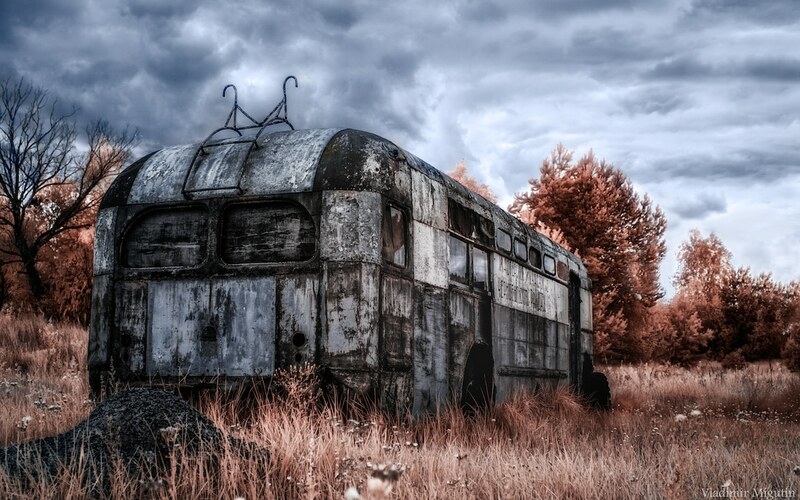 A trolleybus in one of Chernobyl’s scrapyards. Whilst attention-grabbing, I do find this work rather too unreal to be able to properly (and respectfully) accompany personal stories of atrocity. That said, I would be remiss if I did not more fully explore the colour opportunities. 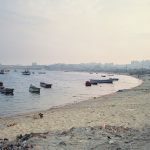 Using split-toning, it is possible to create different kinds of colour field. First, the infrared colour image, as it comes from the camera, simply adjusted for contrast (all IR images are very flat in tone). Mick Yates. 2019. Choeung Ek (The Killing Fields) – from camera. Now, I anted to create an image somewhat in the full-spectrum style of Migutin, although the 720nm conversion makes blue skies difficult to render. By trial and error, I first used a brown split tone in Lightroom, to take off the red cast. An’orange’ sky is the goal, for further processing. Mick Yates. 2019. Choeung Ek (The Killing Fields) – brown split tone. Then I used the Nik Viveza 2 plugin, to take the colour temperature/hue down to zero – it is only possible to go down to 2000K in Lightroom. This renders ‘blue’ skies. The image has warmth boosted in Nik’s Colour Efex plugin for Lightroom. The result is somewhat like a full spectrum image. Mick Yates. 2019. 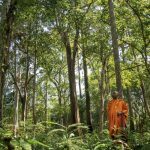 Choeung Ek (The Killing Fields) – blue skies. And to demonstrate reproducibility ..
Mick Yates. 2019. The Bridge. I do find these last images quite interesting aesthetically. I find them more subtle, and thus more ‘thoughtful’ in impression than Migutin’s. I am sure that I can ‘play’ with the various colour settings, to give an almost infinite variety of effects. 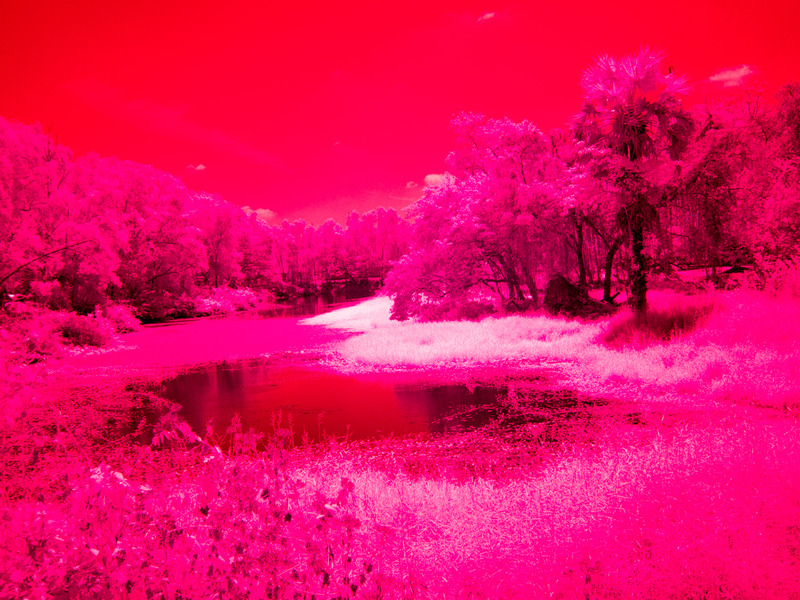 Getting clean and reproducible workflow is a serious challenge with infrared photography. I still believe that the colour infrared is just too overpowering and too ‘false’ to use with such personal stories. Gary and others have consistently argued that I should not be using ‘false aesthetics’ for the sake of it. There has to be a reason, or series of reasons. I therefore stand by my previous rationale, and the conclusion of using black and white. STEWART, Jessica. 2018. 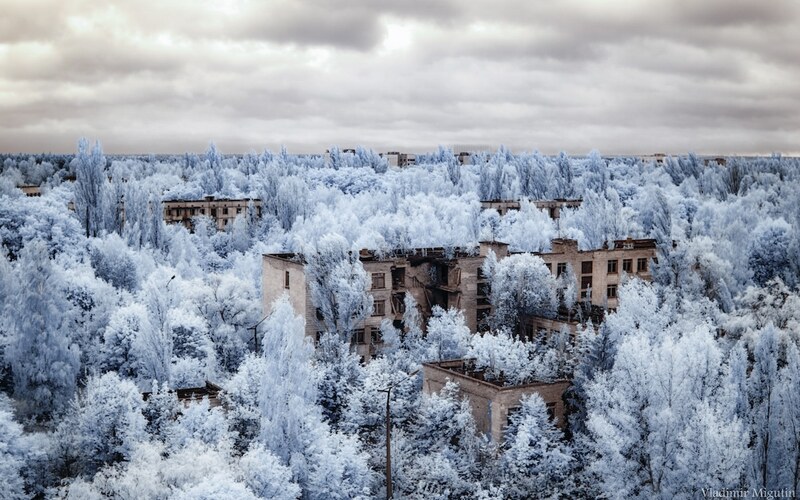 Photographer Visits Chernobyl With His Infrared Camera, Captures Stunning Images. 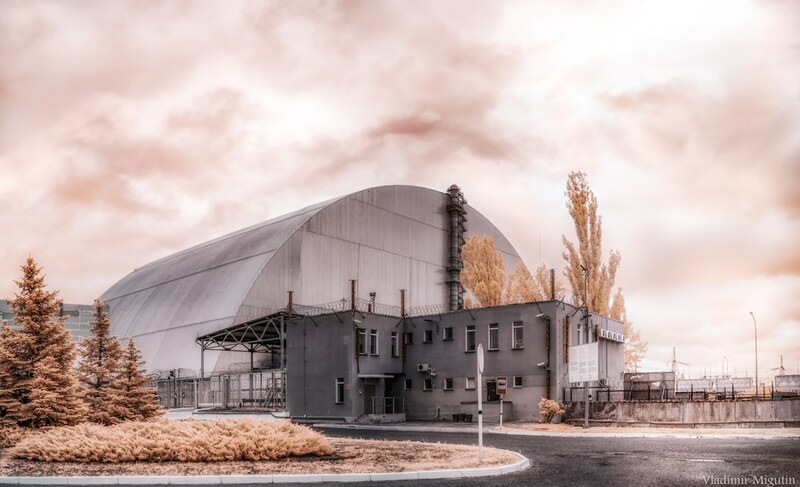 Available at: https://mymodernmet.com/infrared-photography-chernobyl/ (accessed 12/12/2018).